For starters, post more and make sure you understand the network's algorithm. Did you know that Instagram has more than 500 million monthly active users? Wow! No wonder the question I get asked most often is, How do I get more followers on this powerhouse photo-sharing network? So, here are three of my best Instagram growth and management tips. While none of them will guarantee you overnight success, they'll at least lead you to steady follower growth and engagement. The problem is, many people aren't willing to put in the work needed to daily manage an Instagram audience that generates real business results. They want quick and easy tips for buying results. You want to know a not-so-secret secret? That kind of laziness leads to an Instagram account with a lot of followers but not a lot of engagement -- and even fewer sales. So, you'll find no list of sites to buy your Instagram followers here. Instead, check out these tried-and-true tips for growing your followers and increasing engagement the right way. Are you ready? 1. Post on Instagram one to three times per day. The best way to generate business results from Instagram is to be active on the network. No surprise there. But how many times per week should you be posting new 'grams? That depends on your goals.The Instagram accounts with the largest followings are posting 95 times per month. Broken down that's about three times per day. Image credit: Courtesy of Buffer. If you want to cultivate a very large audience, you should post multiple times per day, including weekends. You don't have to post three times per day though. 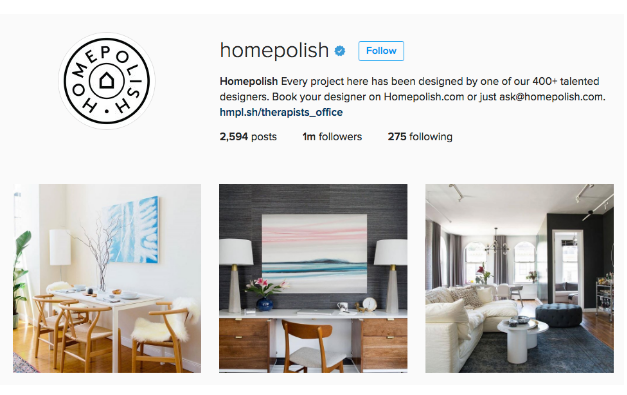 As an example, Homepolish is currently growing its Instagram account by about 2,000 new followers daily and posts only twice a day. The best part? All of these Homepolish posts get really good engagement. That's how you know the company attracted its followers naturally. Really, the worst thing you can do is buy your Instagram followers, because those users will never engage authentically with your content. You may see a bump in likes and generic comments like "Cool!" and "Nice photo!" and "Wow!" but real customers will see right throw those spammy comments. Plus, if you buy followers and Instagram finds out, it will ban your account. Then you will lose access to those fake followers as well as your real followers, and that will hurt! 2. Understand the Instagram algorithm. Instagram rolled out an algorithm change this past summer that shifted the way its posts show up in our image feeds. Instagram now shows us updates it thinks we're most interested in. That means you will probably see photos from your best friends at the top of your feed every time you log in, while photos from companies you only occasionally engage with may be harder to find. From an end-user perspective, you'll likely think that this isn't such a bad change. Now, you'll always see highly tailored content. From a business perspective, however, you want to reach as many people as possible to show up as high as you can in a user's feed. While this is definitely a challenge, it's not impossible. Here is the only thing you really need to know about the Instagram algorithm change: The end user is still ultimately in control. Posts from your best friends will show up high in your feed because you engage with posts from your best friends a lot. If you also engage with posts from a particular company a lot, then posts from that company will similarly show up high in your feed. It's as simple as that. This means that the key for any business to reach its audience on Instagram is simply to post high-quality content that its audience will want to engage with. 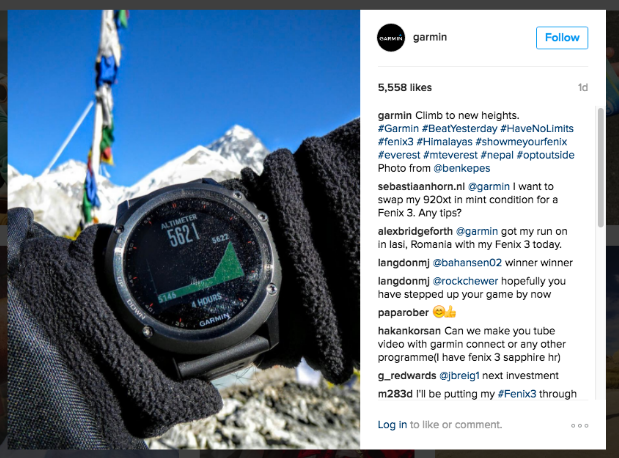 Garmin is one brand that's really great about incorporating customer stories into its Instagram posts -- and a lot of earned engagement ensues every time it does. Here's your challenge for the day: Post a good customer story to your company's Instagram account. Don't forget to tag your customer in the post if they have their own Instagram too. 3. Think carefully about your captions. These companies do. Since we know that the key to working with the Instagram algorithm is to create high-quality content that engages an audience, it's important to spend a little time talking about captions. When you're in a rush to publish a post, the caption might be the last thing you want to sit around thinking about. The problem is, a really great caption can make or break your post. A witty or thoughtful caption will absolutely help you earn a like or a comment because it evokes an emotional reaction. Additionally, comments that include a question in them will not only encourage user engagement but it will prompt it. 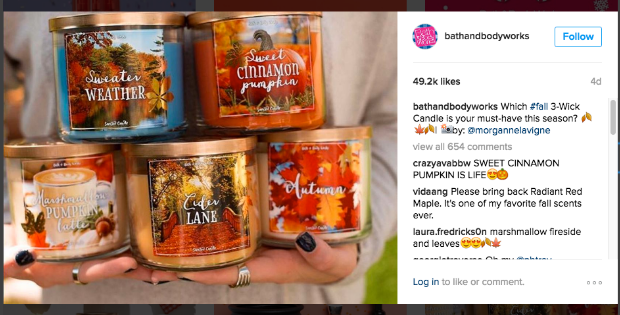 In this post, Bath & Body Works asks its audience members what their favorite candle scent is; and the result? 654 comments! Image credit: Courtesy of Bath & Body Works. 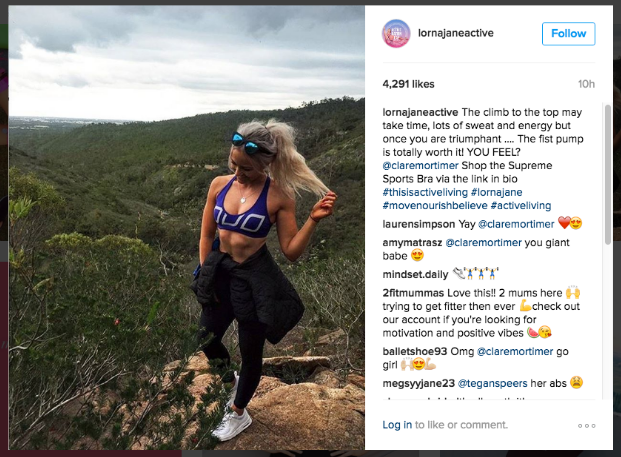 Image credit: Courtesy of Lorna Jane Apparel. Doesn't the caption read like a much-needed pep talk? That kind of authentic, inspiring caption is great for driving engagement! You can see from the comments that followers loved this post. Now that you're armed with tried-and-true methods for growing your following on Instagram, it's time to get started! You can do this; just stay committed and the results will come.